food additives | Curious Foodie. I seek to feed the curious soul in my tummy. Is Saccharin a blessing or a curse? Saccharin is an artificial sweetener or sugar substitute. It is one of the five approved sugar substitutes that have been approved for use in the United States of America. A little history lesson here. There were health controversies that surrounded the meat-packing industry in 1906 that led to the implementation of the Pure Food and Drug Act in the same year. 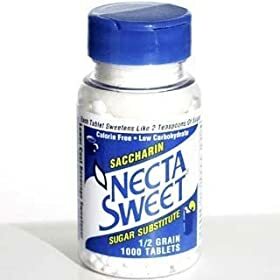 Just merely a year later in 1907, the United States Department of Agriculture began investigating saccharin and it had not ceased till today. This is evident when the Los Angeles Times reported today that Saccharin may lead to weight gain. There is also a survey done by the Calorie Control Council (in 1998) that showed an increase in people’s intake of sugar-free food and beverages. A 2007 survey (see article here) by the council found that the highest number of Americans in the past 15 years, 71 million, or 33% of the population, are currently on a diet. When will this struggle ever end? My stand is to eat whatever your heart desires…only then will you cease all cravings for an extensive amount of soda or resort to diet soda… which most likely contains saccharin…which in turn might lead to obesity. Saccharin is only a blessing to diabetics who cannot afford sugar and might want a sweet “treat” once in awhile. It is however a curse to the rest of us who consume it because it helps us in “dieting”. This totally takes out the gulit in me to reach out for another regular coke. 🙂 What do you think? I'm a baker who loves to eat. A singer who loves a wide spectrum of music. A blogger who enjoys communicating. A girl loved by Jesus. Subscribe to my blog here. A Day As A Tourist In Singapore. Reebonz – The City and Me. Food In China, Through The Eyes Of Jeremy Ang. Fellow Blogger Sherene’s Wedding in Singapore. carpenter apron shoulder straps on Food Photography Tips, Part I.
Leticia Dagg on Peanut Butter Frosting With Chunks of Nuts Recipe. cutlery set stainless steel on Muffins & Cupcakes: Why they are different. best yoga poses for energy on Muffins & Cupcakes: Why they are different. dream kitchen on Bak Chor Mee Is One Of My Favourite Foods.